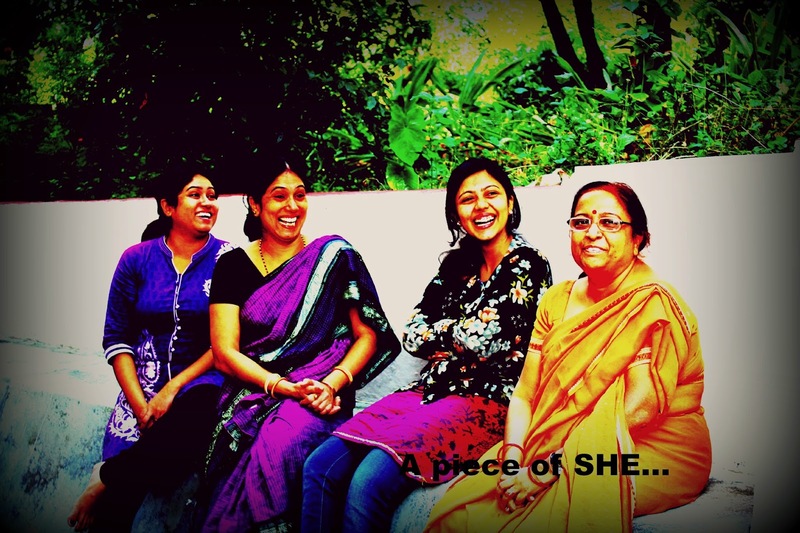 A piece of SHE ...: Counting My Blessings! Well, I am trying to write this article for the second time. I am not sure whether God wants me to write this or not. In my first attempt I had almost finished the article then to my horror my laptop got shut down and I haven’t saved it. So, I am re writing this piece. I wouldn’t have rewritten this if it was about any other topic. May be God wants me to write a better article than the last one or may be its not his will to get published in this blog. I am yet to find out God’s will or maybe he is testing my will. It’s always hard to figure out God. Last year on Nov we had planned a trip to Haldwani to meet our spiritual master. Everyone in the family was excited about this trip as it was my first trip. My training had begun a month before the trip. I had been introduced to all the dos and don’ts. The smell of fear around me made me nervous. I felt a heavy weight on my shoulder to present my perfect self to the Master. 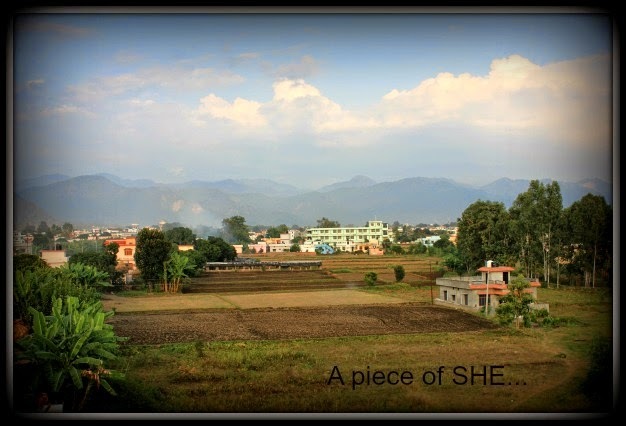 But as soon as I reached Haldwani and met him all those thoughts were vanished from my mind. He accepted my non perfect self perfectly. We took train, “Lalkua Express” on 30th Nov 2013. It was a one day journey and we had reached next day morning. There were 10 other devotees who were travelling with us. During the journey they told me amazing stories about HIM. I felt HIS presence through them. It was like HE was there with us. Everyone’s hearts were filled with joy, love and devotion for HIM. I have not witnessed such a sight before in my life. They were all shining in the spiritual light above them casted by HIM. HE was calling now and then to know about our whereabouts and to know if we had our food. HE was excited as much as we were to see HIM. He cleaned all the rooms alone and prepared food for us before our arrival like a mother does before the arrival of its child at home from school. HIS devotees call him “BabaMa”. Baba means Father in Bengali and “Ma” is Mother. In my seven days stay there I found out how appropriate this name is. He is like both Father and Mother to HIS devotees. Two people or may be many people in one body. He feed everyone like mother and provides guidance like a Father also. HE is not limited in these two roles only. HE also plays various other roles like of a Guru, a friend, a philosopher and a child. HIS place is surrounded with peace and divine silence. Those seven days were most important in my life. I felt like I was at home. It was a different experience. I spent few days away from the world. There was no contact with the outside world, no internet. Just few times I called my family that was the only connection I had with the outside world. It was like living with God in God’s land known as heaven to others. HE used to wake us up with the bed tea in his hand at 6 A.M. Never before in my life had I waked up that early in the morning for seven days continuously. But I didn’t feel bad. I felt fresh and energetic. After having our tea and brushing our teeth we used to come outside in the garden where he used to show us the far away mountains. He was always full of energy and love. He then used to talk with his devotees about general things and simultaneously used to prepare food for us. He never allowed us to cook. He with one of his closed disciple used to cook for us all the time. The place echoed with HIS divine voice and laugh of his devotees. HE also had arranged trip for us around Haldwani like Jageshwar temple and Nainital. We used to start early in the morning and we used to came back in the evening around 7 pm to spend time with HIM. HE used to stay at the ashram. He told us to eat whatever we like even we could have non veg also. We had “Aloo Paratha” as suggested by him and it was delicious and fresh.I never had such delicious vegetarian food in my life before. People of Uttarakhand is GOD loving and fearing. The local people call it "Dev Bhoomi" meaning Land of GOD. Therefore, they never cheat any tourist in the land of God. Master doesn’t have dry outlook toward spirituality. HE is practical and modern. He doesn’t throw countless number of rituals on people without any reason. If HE does ask people to do something its for their own good or for their growth in spiritual path. His only message for us in Haldwani was to enjoy life and remember the GOD inside us wherever we are and whatever we do. In his words, "Say Hello To GOD" in between your busy schedule. " HE doesn't ask anyone to engage themselves in long hours of meditation If that is not your thing. HE would only guide you in the meditation if you yourself is eager to walk on that path to realize the supreme power. I am now writing the last lines of this articles and just wrote the headline ( I always write the headline at the end). Ah! After a long time I wrote a headline with an exclamation mark. This article came up better than the previous one which got deleted. So, God's will was to write a better piece than the last one! Signing off for now ! May God shower his blessings on all of you and to make it more effective please practice HIS/HER presence all the time like I am trying to do.